Like every other vegan across the planet, I’m a sucker for a good tofu scramble. 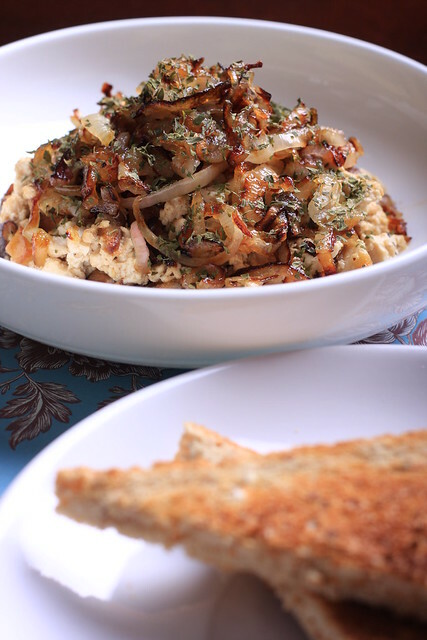 Scrambles are awesome because you can add any kind of spice or vegetable to it and the outcome is always delicious. 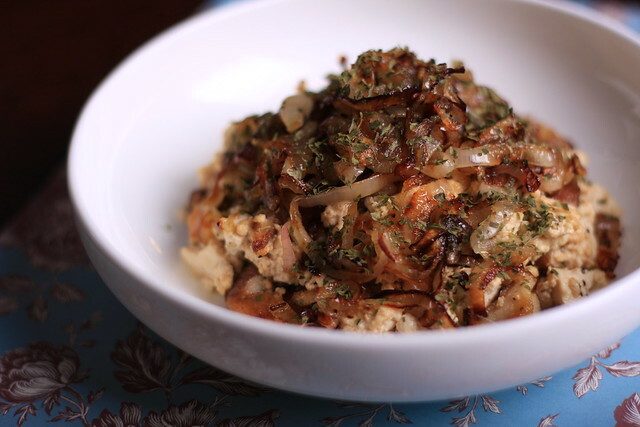 For this scramble, I added some tahini, soy sauce and black salt to some gently sauteed and crumbled tofu before topping it off with caramelized shallots and seared shiitake caps. Served with a side of toast and vegan bacon, this is the perfect breakfast (or dinner) that is filling, cheap and simple. In a medium-sized skillet, heat a bit of oil over medium heat. Add in the shallots and saute until well caramelized, about 15-20 minutes. Only stir every 5 minutes or so. Once they are nicely caramelized, remove from the pan to cool.Increase the heat in the skillet to medium high. Add in the shiitake caps and saute until both sides are nicely seared, about 10 minutes. Remove from the pan to cool. Reduce the heat back to medium. Gently crumble the tofu into the pan and saute until some of the water has evaporated, about 5 minutes. Whisk together the tahini, soy sauce and black salt in a small bowl. Drop it into the tofu and stir until well-combined. Chop the shiitake into small pieces and add back into the pan. Saute for another minute and transfer to serving plates. Sprinkle with the caramelized shallots and parsley and salt and pepper if desired. Serve with toast and vegan bacon. Any leftovers reheat very well microwaved. I've been thinking of picking up some black salt but it looks like the mushrooms and shallots are amazing flavorings enough for this! Thanks foodfeud — yes, the black salt isn't totally necessary, but it does help give it that "eggy" flavor. The shallots and the shiitakes are the stars here! Looking at this has convinced me that I don’t eat tofu scrambles nearly as often as I should be. The caramelized shallots look perfectly done. oh this looks so delicious. I totally have to try it. To be honest I've never tried tofu scramble before!! This is a beautiful dish! While I'm not vegan, I have drastically cut back my meat intake and this recipe looks perfectly delicious and filling. The photo is beautiful!